At CP+ 2015 in Japan this week Nikon were showing their new Nikon 300mm f/4E PF VR super telephoto lens. The lens is an extremely lightweight fixed focal length 300mm with a constant f4 aperture that uses Nikon’s new Phase Fresnel technology to shrink it down to a very handhold-able size. It is 3 inches (75mm) shorter than the original non-VR 300mm f/4 AF-S, and weighs only half as much (755grams). From what I saw it seems to be very sharp despite its small size. The lens uses 16 lens elements in 10 groups and features Nikon’s Vibration Reduction (VR) image stabilisation. 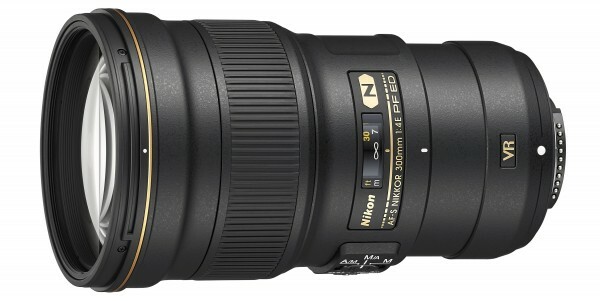 It is the first Nikon lens to utilize the Phase Fresnel (PF) lens element which Nikon claim allows for better control of chromatic aberrations and ghosting, while keeping the optical design of the lens much more compact and simpler. The lens is built using new Fluorine Coat technology for repelling dust, water and dirt. Another outstanding feature of this 300mm f/4 VR is its super close focussing at 4.6 feet (1.4 meters) from the image plane. The Silent-Wave-Motor autofocus is super-fast with Nikon camera bodies and you can grab the focus ring at any time for instant manual focus override. The lens also works well with the Nikon 1.4x and 1.7x teleconverters if you need extra reach. If your looking for a sharp, stabilized 300mm prime lens in a compact, light weight design then this lens is definitely worth considering as long as you can cope with the Nikon ‘wrong way around’ manual focussing. It is available for pre order for $1996.95US from B&H. 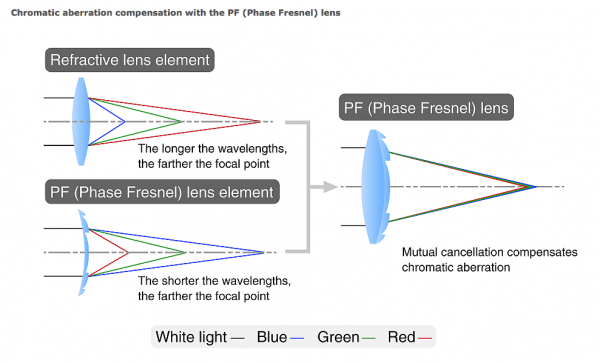 The PF (Phase Fresnel) lens, developed by Nikon, effectively compensates chromatic aberration utilizing the photo diffraction phenomenon*. It provides superior chromatic aberration compensation performance when combined with a normal glass lens. Compared to many general camera lenses that employ an optical system using the photorefractive phenomenon, a remarkably compact and lightweight body can be attained with less number of lens elements. With PF (Phase Fresnel) lenses, on the other hand, image formation is performed in the order of red (R), green (G), and blue (B) starting with the portion near the lens (see the diagram below). By combining the PF (Phase Fresnel) lens with a refractive lens, chromatic aberration can be effectively compensated.